You're currently browsing page: /trompeter-musiker-komponist/519/hamdelaneh/?lang=en of www.markusstockhausen.de. 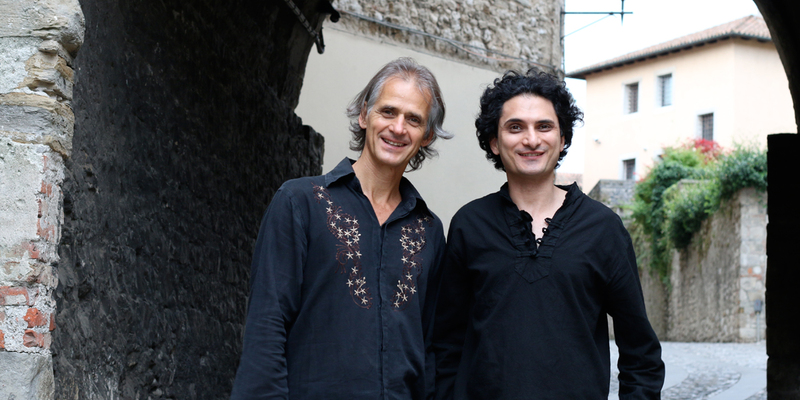 Since 2015 Alireza Mortazavi and Markus Stockhausen have been performing together. East and West meet in an intimate musical dialogue. The music of Alireza and Markus invites the listener to explore expansive sound terrain, is very sensitive but also includes outbursts of intense expression. Alireza, born in Iran, lives now in Italy and has quickly established an international career. The two outstanding improvisers met at a concert for the Iranian Nouruz Spring Fest in Erftstadt, Germany. Soon an invitation followed to the Mittelfest in Cividale del Friuli, Italy, where also the first CD recording HAMDELANEH was recorded live. This music has been published by Dark Companion Records in Italy in March 2019. The title of this publication also became the motto for their duo performances: HAMDELANEH – „With the same heart“. Alireza Mortazavi is an Iranian composer and santoor player with a personal style. He spent about 12 years learning and performing Iranian traditional music and in his teenage years he has received several awards, which show his great expertise in the traditional Iranian repertoire. Contacts with other music genres, especially western music, allowed him to form his own personal, more contemporary style. He participated in notable events, such as shows of the Bavarian Radio-Television and also contributed in many festivals including the Rudolstadt Festival in Germany. In 2003 he went back to Iran and continued his artistic activities, evolving his personal style. In the years while he lived in Iran he began training students, and designed an instrument called Santoor-Piano, that allows playing in different keys without retuning the instrument. In this period, he released the album “Now and Then” and contributed to “Clouds”, published by Hermes Records, in Iran. In 2007 he was invited to Germany to perform in several concerts, including the Total Music Meeting. In 2012 he moved to Turin, Italy, and he toured around Europe for several concerts.